Be the first to share your favorite memory, photo or story of Etelle. This memorial page is dedicated for family, friends and future generations to celebrate the life of their loved one. Estelle Meltzer, 90, of Branchburg, NJ, passed away peacefully on Wednesday, January 30, 2019 at her home surrounded by her loving family. Estelle was born in Bayonne, NJ, she lived in Edison for most of her life, then moved Bridgewater for 3 years, before moving to Branchburg 3 years ago. 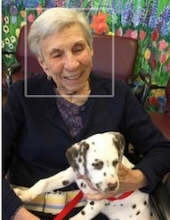 Estelle was a proud Vice President of the Jewish Community Center in Highland Park, NJ. She was also President of the PTA. In her spare time her passions were knitting, traveling around the world, especially to London, and cooking and baking for everyone she knew. Her beautiful heart will be sadly missed by all who knew and loved her. She is preceded in death by her beloved parents, Henrietta and Harry Greenberg; her loving husband of 50 years, Seymour; and her brother, Jerry Greenhill. Surviving are her dear son, Eric and his wife Maggie of Branchburg, NJ; three loving daughters, Leslie and her husband Lary Schimel of LA, CA, Fern and her husband Mark Holody of Toms River, NJ, and Amy and husband Howie Shain of Oxnard, CA; six cherished grandchildren, Emily, Ryan, Liz, Jeffrey, Cody, and Erin; and 7 adored great-grandchildren, Sloane, Adrian, Aidan, Simon James, Mia, and Jackson. Services will be held graveside at 11am on Sunday February 3, 2019 at Beth Israel Memorial Gardens, US HWY 1 N., Woodbridge, NJ. Shiva will be held at 71 Vollers Drive, Branchburg, NJ from 2-9pm. To send flowers or a remembrance gift to the family of Etelle Meltzer, please visit our Tribute Store. "Email Address" would like to share the life celebration of Etelle Meltzer. Click on the "link" to go to share a favorite memory or leave a condolence message for the family.